Almo Nature Cat HFC 70 Natural Chicken is a meal for cats that consists of pure chicken and other natural ingredients. Attention: This product has undergone a name change from Legend to HFC, the composition has not changed. 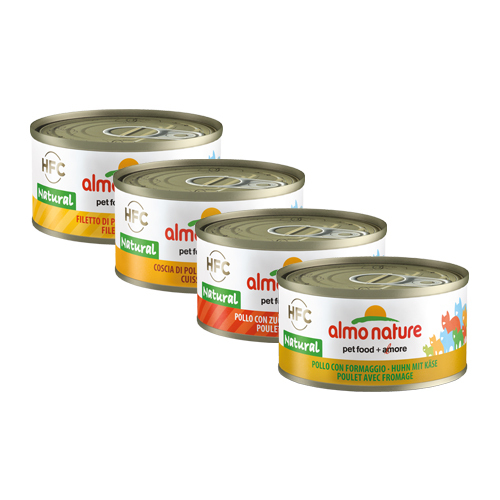 Almo Nature now has a meal for adult cats, named 'Almo Nature Cat food HFC 70g Chicken' This classic and tasty canned food is prepared with natural ingredients and is comprised of no less than 75% meat. The chicken is free from added hormones and antibiotics. The fish used is freshly caught from the sea and no farmed fish is used. The meat, fish and vegetables are cooked and cut without chemical treatment. They are then preserved in their own cooking water. Through this process, they retain their own flavours and no minerals, vitamins or additives are added, because the meat, fish and vegetables are naturally rich in these elements. In addition, there is also a small amount of rice added to the meal. Almo Nature products have no added chemical preservatives or colourings. Simplicity, authenticity, and traditionalism make this meal into a true classic with a flavour that cats will love. Almo Nature recommends that cats receive 60% wet food and 40% dry food daily for a 100% nutritional balance. The difference is that in Legend the meat percentage is higher than in Classic food, and Classic food has a lower calorie content. Some products that used to be under the Classic range have now been moved to the HFC name. However, this transition is not yet fully completed in all countries. As a result you may get an Almo Nature product in the old packaging. HFC Chicken is available in 8 flavours per 24 cans of 70 grams. Have you used Almo Nature - Cat - HFC 70 Natural - Chicken before? Let us know what you think about this product. This is my cat favorite food !